Have you noticed that when a new hotel or commercial building is being constructed, the architects will invariably install large mirrors in the lobby? Ever wondered why? Apparently we complain less when we’re looking at ourselves. But like the mirrors you sometimes find at amusement parks, our self perception can so easily become warped or distorted when we view ourselves through the eyes of other people rather than God. It is bad enough when this is tolerated in a community and remains unchecked. But it is much worse when religious leaders encourage and exploit their image or position. Then it becomes abusive and manipulative. I have been a victim of that kind of spiritual abuse. And if you have been a church member for any length of time, you probably have been too. Spiritual abuse ranges from the relatively benign to the lethally toxic, but usually stems from a misuse of authority by religious leaders. Regardless of the degree of abuse, it is always destructive. Religious exploitation is most easily identified when there is manipulation or coercion. However, it may arise in more insidious ways when likeable, even lovable, charismatic individuals take advantage of their positions to exploit those they care for. Parents may spiritually abuse children, husbands and wives may abuse each other, pastors may abuse members, lay leasers may abuse ministers, televangelists may abuse supporters. Abuse occurs when we exploit other people to advance our own self-interests. In our series The Passion of Jesus in Matthew’s Gospel, last week we focused on Jesus authority – We saw Jesus is both the Son of David and the Lord of David. Jesus Confronts Religious Abusers from Stephen Sizer on Vimeo. The religious leaders exploited their role and abused God’s people. To them, ministry meant imposing lots of rules and regulations that dictated how you worshipped, what you wore, what you ate, who you could associate with. And Jesus says, they added to people’s burdens. The Pharisees were harder on others than they were on themselves. They assumed a status and an authority the Lord had not given them. A literal translation of verse 2 would be “The scribes and the Pharisees have seated themselves in Moses’ seat”. There is no record in the Scriptures that God assigned any authority to them. Their only authority came from teaching the Word of God. Therefore, Jesus says, people should obey whatever the Pharisees taught from the Scriptures. But they need not obey the abusive and burdensome man-made rules the Pharisees imposed. Holiness does not consist in keeping lots of rules. Spirituality is not cultivated through guilt and fear. The Pharisees judged the spirituality of others by how rigorous they were in obeying their rules. I’m less likely to act like the Pharisees if I first ask myself how a Bible passage applies to me before I look for an application for you. We all face the same temptations and I am just as likely to fall into sin as you are. We are all equal at the foot of the cross. Now that does not mean that we should not strive to become holy or more like Christ. It does not mean that we should not hold one another mutually accountable either. Our membership scheme is based on this Guide. We have embraced it because it is rooted in Scripture and identifies the basic practices expected of any follower of Jesus Christ. At Easter we will invite you to put your name to a simple declaration that, with God’s help, you will be an active member during the year ahead. Based on Scripture, these affirmations define how we can best grow to maturity together as disciples of the Lord Jesus Christ. Protecting the unity of our church. Sharing responsibility for our church. Serving the ministry of our church. Supporting the testimony of our church. Co-operating with the leaders in fulfilling the Vision of our church. “With God’s help…” for we acknowledge that it is only by grace that we are saved. And it is only by grace that we serve. So, if we want to avoid spiritual abuse, lets stop playing spiritual games of one-upmanship and help one another cultivate a simple faith. Be Holy: Cultivate a simple faith. 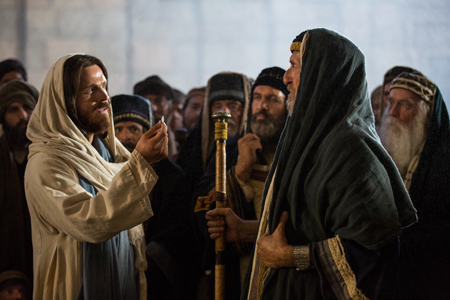 To the Pharisees, what mattered was being seen, being recognized and revered. They used religious jewelry to display their piety. “Phylacteries” were small leather boxes into which the Pharisees placed portions of the Scriptures. They wore these boxes on their foreheads and arms. They took the commands of Deuteronomy 6:8 and 11:18 all too literally. “equip [us] for works of service, so that the body of Christ may be built up until we all reach unity in the faith and in the knowledge of the Son of God and become mature” (Ephesians 4:12-13). Be Holy: Cultivate a Simple Faith. Be Hidden: Content with a Secret Faith. The best way to avoid pride is by giving the glory back to God… where it belongs. He deserve all the praise and glory that comes our way. Our privilege is to serve the High King of the universe and to be His child. True greatness is found in serving others, not in expecting or coercing them to serve us. That is why we encourage every member of Christ Church to identify their spiritual gifts and use their talents to serve others joyfully, willingly, freely. Knowing that the glory belongs to Jesus. Not to us. We find our value and security not in what others think about us or do for us, but in his love and in belonging to Him. • Abusive leaders base their spiritual authority on their position of office rather than on their service to the group. Their style of leadership is authoritarian. • Leaders in abusive churches often say one thing but do another. Their worth and deeds do not match. • They manipulate people by making them feel guilty for not measuring up spiritually. They lay heavy religious loads on people and make no effort to lift those loads. You know you are in an abusive church if the loads just keep getting heavier. • Abusive leaders are preoccupied with looking good. They labour to keep up appearance. They stifle any criticism that puts them in a bad light. • They seek honourific titles and special privileges that elevate them above the group. They promote a class system with themselves at the top. • Their communication is not straight. Their speech becomes especially vague and confusing when they are defending themselves. • They major on minor issues to the neglect of the truly important ones. They are conscientious about religious details but neglect God’s larger agendas. If you check out our church website www.cc-vw.org and look under policies, you will find our safeguarding policy and our pastoral care policy. These are designed to ensure we are a safe church especially for the young, the elderly and the vulnerable. So how do you distinguish between spiritual abusers and Godly leaders? Between shepherds and a wolves? Abusers elevate themselves; true leaders elevate others (Philippians 2.3). Abusers exert authority; leaders rely on servanthood (Matthew 20.25). Abusers make service a grind; leaders make service fulfilling (Nehemiah). Abusers fix blame; true leaders take responsibility (Philemon. 18-19). Abusers know how; true leaders show how (Exodus 18:17). Be Humble: Concentrate on a Serving Faith. Back in the Middle Ages, in the years 1014-1035, England was ruled by the Danish King Canute. Apparently, he grew tired of hearing his retainers flatter him with extravagant praises of his greatness, power and invincibility. One day he ordered his throne to be set down on the seashore. He commanded the waves not to come in and wet him. But as you know, his order was not obeyed. The waves soon lapped around his chair. One historian tells us from that day on, he never wore his crown again. Apparently he hung it on a statue of the crucified Christ. What do you need to hang on the cross today? Let us pray. I warmly commend John Maxwell’s book There’s no such thing as Business Ethics: There’s only one rule for making decisions. It contains the following ten principles of conduct we seek to follow at Christ Church. “When ethics – the Golden Rule – is at the center, all compartments of life are harmonized and integrated. The golden rule is right. It also happens to work.” John Maxwell. 1. If you have a problem with me, please come to me (privately). 2. If I have a problem with you, I’ll come to you (privately). 5. Be careful how you interpret me – I would rather do that myself. On matters that are unclear, do not feel pressured to interpret my feelings or thoughts. It is easy to misrepresent intentions. 6. I will be careful how I interpret you. (c) it involves a child who has been physically or sexually abused. (d) in cases of church discipline, the clergy will follow Jesus instructions in Matthew 18:15-20. I expect the same from you. 8. I do not read unsigned letters or notes. 9. I do not manipulate; I will not be manipulated; do not let others manipulate you. Do not let others try and manipulate me through you. 10. When in doubt, just say it. If I can answer it without misrepresenting something or breaking a confidence, I will. Adapted from John Maxwell, There’s no such thing as Business Ethics (Warner, 2003) pp.44-45. and also to Jeff Strite, Jim Miller and Ian Bliss for their helpful sermons on Matthew 23 over at Sermon Central. This entry was posted in Bible, Sermons on February 21, 2014 by Stephen Sizer.